Sunrise greets a flowing field of Texas bluebonnets. As the state wildflower, the bluebonnet is a favorite of Texans everywhere. In the meantime, I’ve spent more time in downtown Austin searching for unique angles of the skyline where few, if any, cranes are visible. That is a difficult task. Still, there are a few locations where you can minimize the distractions. And from certain perspectives, the cranes are easily removed through post-processing in photoshop. In the winter months when the trees are bare, I like to shoot at a few of these locations. First, Lou Neff Point offers a great view across the water of the downtown cityscape. In late January, the sun rises directly down the eastern flow of Lady Bird Lake. Often on cold mornings, fog drifts off the warmer water creating a mystical feel as the first light permeates the mist. From about 40 minutes before sunrise to a few minutes afterwards, this single location offers a great contrast in lighting conditions, and you don’t have to move at all. Just wear warm clothing because standing still when the temperature is in the low 30s is not a recipe for patience. Next, I enjoy shooting at a pool near the Long Center. On calm mornings, this shallow structure gives wonderful reflections of Austin’s most well-known high rises, including the Austonian and the Frost Tower. Two flag poles rise in the same image and give you a chance to use them in framing the buildings if so desired. I also like to create a panorama from this area, and that allows me to include most of the skyline and even the Long Center itself. On a cold morning near the Long Center, the Austin skyline shines in the early morning air. In the southeast, the crescent moon leads the sun above the horizon. This pool to the north of the Long Center offers great reflections of this beautiful central Texas captiol city. Recently, I’ve also been flying my drone a bit more in an attempt to capture some unique views of the downtown area. About 25 minutes before sunrise, with a faint glow of orange on the horizon, I can start shooting downtown Austin aerial photographs. With such low light, many of the shots come back blurry, so I make sure I take plenty. Usually, I can obtain a few crisp RAW files to work with, and often use them in creating wide angle panoramas of the skyline. The image below shows downtown as seen from South Congress Avenue looking north, and this panorama is made of 3 separate images. At the end of South Congress is the Texas State Capitol. The Austin skyline awakens to soft pastels of pink and blue in this aerial panorama image looking down Congress Avenue towards downtown and the Texas State Capitol. Taken on a cold February morning, this view shows the high rises that make up the cityscape of this capitol city. While I await our spring wildflower season, locations such as these keep me coming out for early morning sunrises. But I do admit, I’m ready for spring. We just need a little rain to make the wait worthwhile! In the meantime, happy travels, everyone! As I reflect on 2015, I’m filled with thankfulness on what has been a really good year. My life is busy. Trying to manage a hectic work schedule while keeping a wife and two wonderful little girls happy can be formidable. And I know I’m not alone in this challenge. Lots of folks out there work through the same issues – some going at it alone and with much less support. So for starters, I’m grateful for the patience of my family. As my photography business has grown over the last few years starting with the Rob Greebon Photography website, free time has become a premium. And with the launch of my newest website, Images from Texas, business has more than doubled in the last 9 months. That’s great, but it also creates more demands and responsibilities. I’m also excited about the future. My girls are old enough now where they are starting to want to accompany me on some of my treks. While I’m not sure if they are quite ready for 4am wake-up calls, they did stay out with me one night to photograph the Milky Way while at Pedernales Falls (yes, the following day was a bit tough). More adventures will be in their future, I imagine! On a summer night, two precious girls enjoy the view of the night sky in the Texas Hill Country. Along with this, around the middle of June, whether through circumstance or fate or whatever you want to call it, a new opportunity arose in my life. With support of my family, stepping through this opened door has been a blessing – both with the new people I’ve met as well as the enjoyment of day to day life. While I won’t go into more detail, it was a prayer answered. I’m also thankful for having the good fortune to live in the Texas Hill Country just outside of Austin, Texas. The state parks are enchanting and the opportunity to photograph the Texas landscapes seem endless. I’m a short drive from the Pedernales River and Pedernales Falls State Park, and it isn’t too much further to Enchanted Rock. The sunrises and sunsets can be stunning. Often when I’m out at sunrise I’ll not see another person the entire time. I do like my quiet time. The Texas Hill Country also offers dark skies which are perfect for photographing the night sky. Whether it is the Milky Way or a meteor shower, clear nights can be amazing. 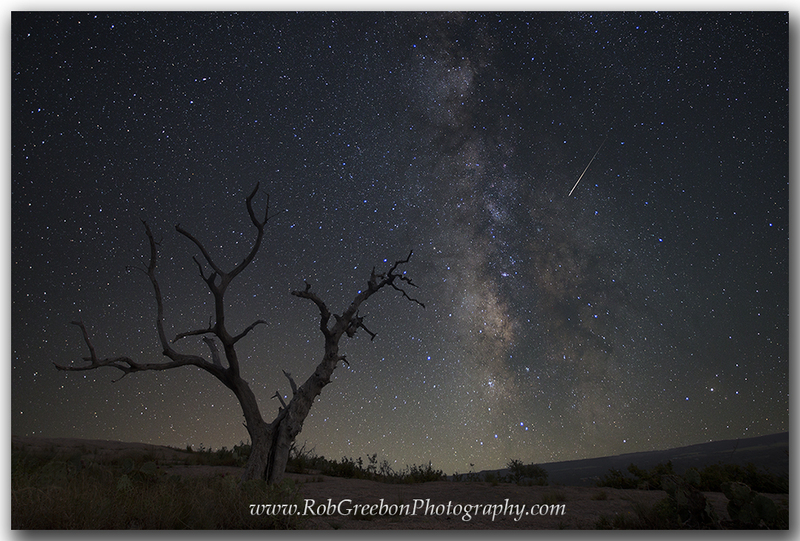 Here is a time-lapse image from the Perseid Meteor shower that comes around each August. This final image is a composite of over 3 hours of photographing the meteors. The Perseids rain over Pedernales Falls on a clear night in August. Another aspect of life I’m grateful for is the beauty that I find in the details of what I photograph. This idea is especially evident each spring when I’m out searching for Texas wildflowers. Sometimes when I find a field of bluebonnets, I am in awe of the beauty that springtime in Texas brings. I know there is suffering in this world, but there is also good. And through my photography I try to bring out the uniqueness, the color, and the amazing scenes that are out there for us to appreciate. As I get older, I think I’m getting better at enjoying the little things despite a hectic schedule. I try to stop and really notice my daughters – their expressions, their wonder, their precious mannerisms. I am not as stressed about things that just don’t matter in the big scheme of things. I stare at the the stars a little more at night; I study the patterns and petals of a red and gold firewheel just a bit more when it blooms in the spring. The fleeting time I have with my few close friends I appreciate even more for I know the moments will not last. I have a pretty good life, and it is just getting better. 2016 is going to rock! I had the opportunity to travel through the Texas Panhandle during the middle of Thanksgiving. I took this opportunity to spend a few days at Palo Duro Canyon State Park just south of Amarillo. I’ve passed by this area so many times to and from Colorado, but my car was always packed and I’d have miles to travel before I slept, so Palo Duro never made it in the plans. This time, however, I stopped. And I’m glad I did. First, I invite you to visit this gallery and see all my Palo Duro Canyon images. I’ll also be adding the same images to this gallery, but it will be a bit longer as this location is still a work in progress. The gates at Palo Duro Canyon State Park do not open until 8:00am. This can pose a problem for photographers if you are not staying in the park. As I was with my family, and camping out in 20 degree temperatures was not an option, we stayed in nearby Canyon, Texas. So in order to shoot in the canyon at sunrise, I arranged with a park ranger to enter the park boundaries about an hour before sunrise. This kindness from the Park folks made all the difference on this trip. I was able to photograph sunrise both at the canyon rim and down on the trails, and the colors I enjoyed were magnificent. The sun peeks over the distant canyon walls at Palo Duro Canyon State Park on a cold November morning. Below me opened up the 2nd largest canyon in North America, more than 800 feet deep and hundreds of miles long. This area of the Texas Panhandle offers endless outdoor experiences, and sunrise at the canyon rim should not be missed. One evening, I convinced my patient wife to accompany me on a 6 mile walk (round trip) to one of the icons of the park, the Lighthouse. This trail is the most popular in the park. As we walked the first three miles, we encountered many folks returning, but no one going our way. We arrived about an hour before sunset. We had the beautiful hoodoo all to ourselves. We explored, talked, took in the view, and enjoyed a sunset not soon forgotten. Our walk back as a nearly full moon lit the trail before us was both surreal and enchanting. With the moon rising in the east and the sun setting in the west, the Lighthouse at Palo Duro Canyon shows its orange color in the fading light of day. This panorama shows the view from the small plateau near this iconic rock structure in the Texas Panhandle, and below the canyon stretches for miles and miles. As far as the technical aspects of shooting here, I’d suggest a tripod and a wide angle lens. I primarily used my Canon 11-24L and my 24-105L (just a bit). All images were shot with the Canon 5DSr, and the details are incredible. On the way back to the Hill Country, I also had the opportunity to shoot both a cotton field and a crazy good sunset over a field of hay bales, and both seemed about as “Texas” as you can get. The sunset was amazing over this Texas field. Hay bales were rolled and ready for the winter, and overhead wispy clouds drifted by as the sun set on the horizon. If you like rugged Texas landscapes, I hope you get the chance to visit this remote part of our state. It is well worth the effort. Personally, I’d like to return in spring when everything is turning green and the wildflowers are blooming and again in Autumn when the trees are changing. In the late afternoon on a day this past April, I was at home debating about whether I wanted to drive the 1+ hour to Llano, then onto Mason in search of wildflowers. I knew there were some nice fields of springtime blooms between these two towns, but storms had been blowing across the Texas Hill Country all day, and radar showed more moving in. Still, the forecast showed these storms would dissipate around 8pm. Hesitantly, I headed out, drove up Hwy 71, and as I neared Llano, the rain was so intense I had to pull over (the first time I’ve ever pulled over because of rain). I checked the Ipad and the radar showed the storms would/should be passing through in the next hour. Again, I considered returning home, but instead waited for the rain’s intensity to decrease (it did not stop but did lighten up a bit) and I headed on through Llano, then turned towards Mason. About half way to Mason, light began to appear in the west. Behind me, a rainbow rose into the dark sky as lightening still flashed across the angry clouds. I stopped in several places to capture the rainbow, then the clouds lit up. The image below was one of the highlights of that memorable trek. It was still raining as I reeled off several shots of these amazing mammatus clouds over the wildflower field. Recently, I found out this photograph of Hill Country Wildflowers after the Rain 1 was awarded the grand prize in the Texas Hill Country Alliance’s 2015 photo contest. This was quite an honor, and it is the second time one of my images has won the top prize. In 2013, my “Milky Way over Pedernales Falls” was the winner. I gave up some sleep and stayed out very late that night, as well, to photograph the stars. After a strong storm had blown across the Texas Hill Country, evening fell and brought with it some crazy clouds hanging over a Texas wildflower field. This image won the grand prize in the Texas Hill Country Alliance’s annual photo contest in 2015. So I’ll keep on traveling – looking for those unique views of Texas and all that the Lone Star State offers, and I’ll share them when I can. Visit my Texas Wildflower Gallery to look at more images. See ya’ll out on the road! I have spent the past 6 weeks in Colorado hiking, photographing the amazing landscapes, and enjoying the cooler weather. From the southern portion of the state in the San Juans to the Maroon Bells near Aspen to my base in Winter Park, the roads I’ve taken have been beautiful and exciting. Along with a friend, I was able to climb another 14er this summer (Humbolt Peak – 14,064 feet), my 31st mountain over 14,000 feet, along with hikes to Booth Lake (over 10 miles) and Byers Peak (nearly 13,000 feet). All were great experiences that left us a bit tired but satisfied with our accomplishments, especially the 14.90 mile trek up Humbolt Peak. Here is the view from the summit as it looks across to Crestone Needle and Crestone Peak. From the 14,064 summit of Humbolt Peak, Crestone Peak and Crestone Needle rise into the amazing Colorado landscape. The last week or so I was in Colorado, high country wildflowers began to bloom. Oh, if I only had a few more weeks there! 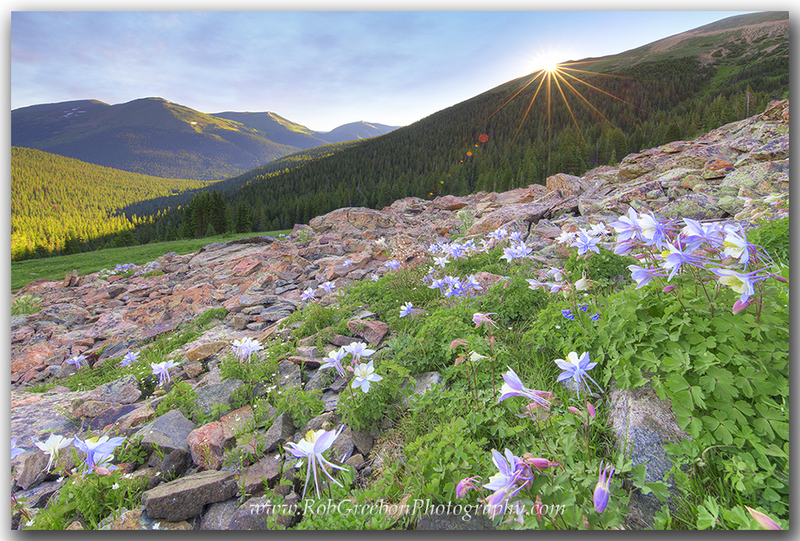 Near 11,500 feet, these beautiful Columbine – Colorado’s state wildflower – waited for the morning sun to warm up the rocks and start the day. I, too, was ready for the sunlight. On this morning, the temperature was below 40 degree and rain had fallen the night before, leaving everything wet. 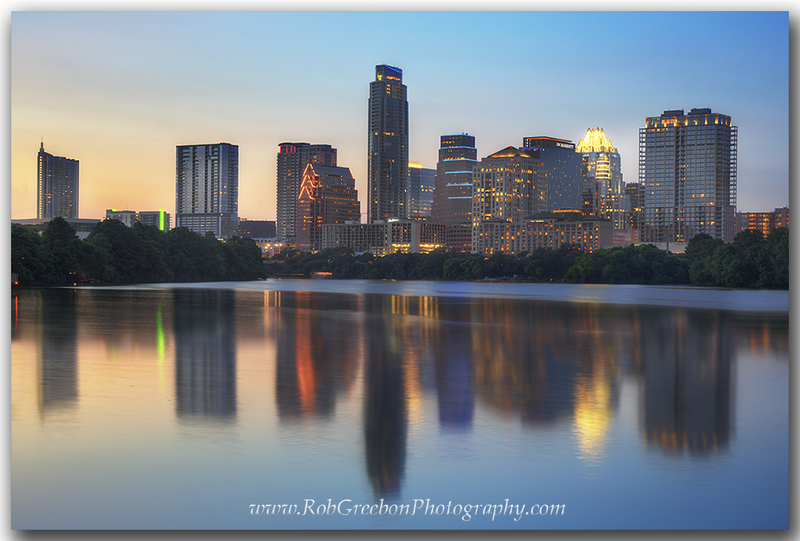 But alas, work calls and I had to return to photograph the Austin skyline for a client. On a July evening, the Boardwalk along Lady Bird Lake offers great views of the Austin skyline. When I was rolling out of Winter Park, the temperature was 41 degrees. Even while driving through New Mexico, the temps staying in the 60s. Amazingly, as soon as I crossed into Texline on the Texas/New Mexico border, the temperature suddenly jumped into the 90s. That’s crazy! And now we’re in the 100s once again. I think it is going to be a long month of August (Coincidentally, August and February are my least favorite months of the year for many reasons… but that is another story). The goal now is to survive August, find a few nice photo opportunities, and make it to the fall when the leaves change and the cooler temperatures prevail! I’ve driven 500 miles the last week in search of bluebonnets. But between readying a new website, trekking around for wildflowers, and processing these images, I just haven’t had time to update this blog. Nevertheless, this will be my attempt to add a little more information. A dirt road in the Hill Country can offer Texas Bluebonnets and other beautiful wildflowers. Another nice surprise was a trip to Big Bend. After good rains over the winter and spring, I was fortunate to be there when the bluebonnets were out and other wonderful wildflowers were in the middle of a desert bloom. While I’ve visited this amazing and remote national park, I’d never seen the colors I enjoyed this trip. In the photograph below, a patch of bluebonnets rests under a rare rainbow – just very good (and lucky) timing! Good timing found me photographing bluebonnets as a rainbow appeared in Big Bend National Park. Bluebonnets are out! So if you enjoy driving the Hill Country, now is the time. The blues won’t last long. Next will be the reds and oranges of firewheels and coreopsis, along with a myriad of other wildflowers… just a few weeks away! Thanks for stopping by. Safe travels to everyone. Texas beauty is different from Colorado beauty. Still, in its own way, Texas has some scenic locations. After leaving Colorado and the Rocky Mountains and returning to Texas, I figured I’d better get used to the heat again. So I headed outdoors. One of my favorites is Enchanted Rock State Park in the Texas Hill Country. Since I’ve been home, I’ve driven the hour-plus to shoot both sunset and sunrise. For sunrise, I arrived in the middle of the night and also attempted to photograph the Perseid meteor shower in mid-August. (I still have not had time to go through those images). This past week, I drove out to this Texas state park and photographed the landscape at sunset, then captured the milky way a few hours after that. On top of the huge granite uplift just north of Fredericksburg, there are some old dead trees. To me, these make the perfect foreground for Texas landscape photography. 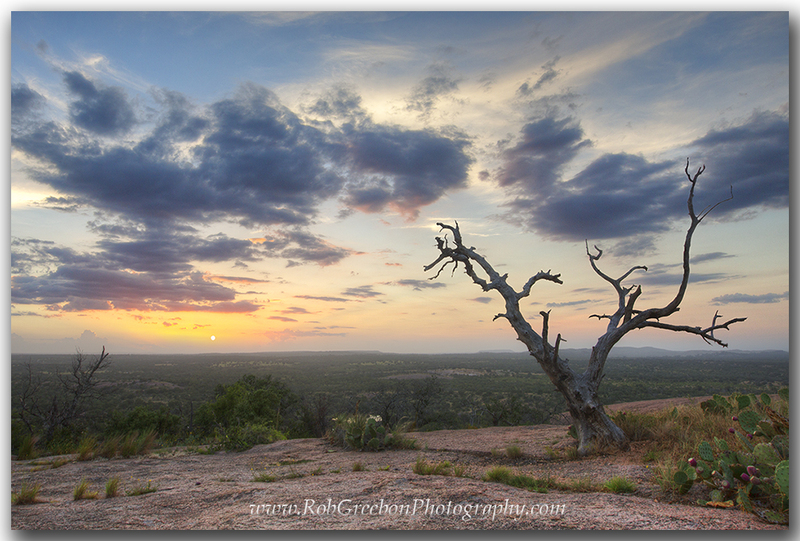 The sun sets across the Texas landscape in this Hill Country image from Enchanted Rock State Park. For this particular trip, I shot both to the west (for sunset) and south (for the Milky Way). While walking down the outcrop, I even got lost. Yes, I know that sounds strange, and I’ve been here at least 20 times! I always take a GPS as insurance, but on the way up, the GPS didn’t pick up satellites until halfway up the rock. On the way down, after watching the Milky Way move across the sky for a few hours, everything looked different in the dark. The Milky Way rises over the Enchanted Rock and the Texas Hill Country on a hot summer night. I wandered around for 45 minutes before finally finding my car. I figured I’d either end up on 962 or I’d start back up the rock, so I wasn’t too worried. Still, things are creepy in the middle of the night – and I’ve done plenty of hiking both here and in Colorado. I survived. No Bigfoot, UFOs or crazy folks that night in the Texas Hill Country. Just me. For more images from this area, feel free to visit my Texas Hill Country Gallery.